The top medical marijuana stocks are climbing this week after Election Day 2016 turned out to be a defining moment for the marijuana sector. New marijuana laws won in eight of the nine states where they were on the ballot this year. And that has created a massive catalyst for the top medical marijuana stocks on the market. Voters in California, Massachusetts, and Nevada approved recreational marijuana initiatives on Nov. 8. Arizona was the only state to reject the recreational marijuana initiative, but it was close. Just 52% of voters in the state voted against it. But the victory in California is a game changer for the industry. The state's size, economic impact, and political clout means California's adoption of legal marijuana could prompt federal authorities to reverse their decades-long prohibition on marijuana. On the medicinal marijuana side, voters in Florida became the first southern state to approve a robust medical marijuana proposal. Arkansas soon became the second. The win in Arkansas was a surprise given the muddled history of the measure. Two proposals were on the ballot in Arkansas, but a late court ruling meant only one could be voted on. Meanwhile, medical marijuana initiatives sailed through in North Dakota. Nearly two-thirds of voters in the state cast ballots in favor of medicinal pot. Additionally, voters in Montana passed initiatives to relax restrictions on the state's existing medical marijuana laws. Montana first approved medical marijuana in 2004, but had gradually chipped away at the measure since. This year, medical marijuana supporters included a ballot item to roll back most of the state's existing restrictions. Nearly 58% of voters in the state voted "yes" on the rollbacks. Medical marijuana is used to treat ailments like Alzheimer's disease, cancer, chronic pain, epilepsy, glaucoma, and multiple sclerosis. 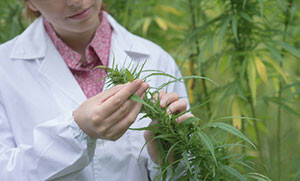 Studies are ongoing to discover new areas where medical marijuana can be used as an effective treatment. GW Pharmaceuticals Inc. (Nasdaq: GWPH), a leader in the medical marijuana space, has seen its shares surge 89.11% year to date to $131.32. INSYS Therapeutics Inc. (Nasdaq: INSY) is working on a synthetic cannabidiol for childhood catastrophic epilepsy syndromes. At $14.14, shares are up 30% over the last month. Cara Therapeutics Inc. (Nasdaq: CARA) is a clinical-stage biopharmaceutical company working on cannabis treatments for pain. At $9.65, shares are up 26.63% over the last month. Sales of legal marijuana in the United States reached $5.7 billion in 2015. That was up from $4.6 billion in 2014, according to ArcView Market Research. Meanwhile, recreational sales surged to $1.2 billion in 2015. That's a huge gain from the $374 million in 2014. According to ArcView's new report, retail marijuana sales should hit $7.1 billion this year. That would be a 26% hike from last year. By 2020, legal market sales are expected to surpass $22 billion. That growth will continue to be a huge driver for the top marijuana stocks. As a service to Money Morning readers, we've created a 90-page cannabis investing guide called "The Roadmap to Marijuana Millions." This "bible of weed investing" reveals the world's top marijuana stocks every serious investor should consider right now. Normally valued at $499, it can be yours absolutely free. To learn how to get your free copy, click here. This offer is only available to the first 500 people who respond today. So please go here now to reserve your copy.